Harry is supported by a committed and enthusiastic team of both long term members of staff and working pupils. 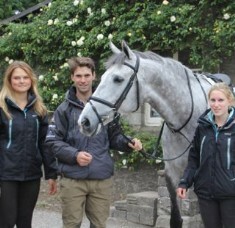 Eventing is very much a team effort and it takes huge dedication from everyone involved. We are reliant on the expert advice and work of the support team, all of whom are leaders in their own respective fields. Harry’s horses benefit from the excellent communication and teamwork between all those involved - owners, rider, the yard staff, trainers and the external support team.